Last night, beloved and I had dinner at Mesa. We were in Greenbelt, and had pretty much little choice as most of the restaurants there were out of our budget’s reach. Not that Mesa is for the impoverished, no, but we could afford it. 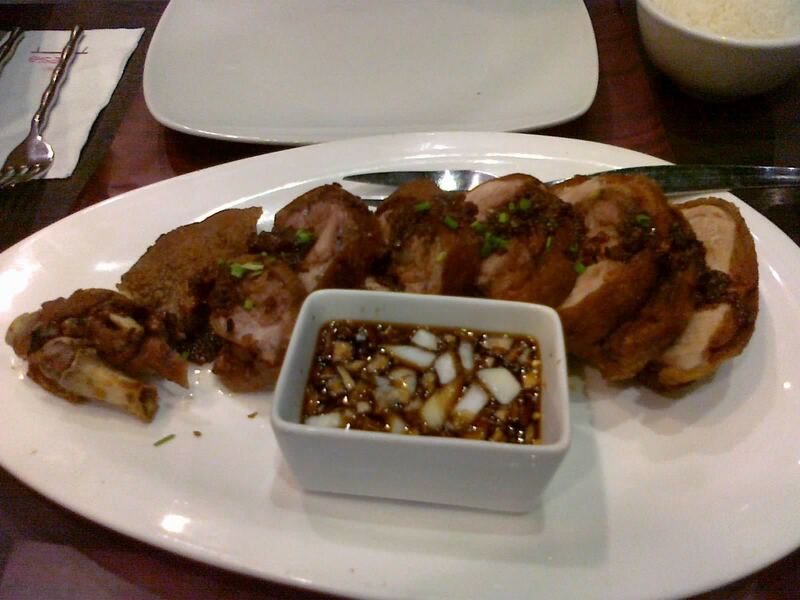 We also don’t usually eat Filipino food, which is what Mesa specializes in. Filipino food for me is composed of either stews or not-so-tender fried/grilled meat or soupy veggies that I don’t really fancy. Not that I don’t eat them, but when given a choice, I don’t pick them. Although we did have a choice today, beloved read a good review on this and also saw that they serve ostrich, so we went ahead. As I’ve said, Mesa specializes in Filipino food. I guessed that their menu items are good for two to three people considering the prices and how that’s usually the way Filipino restaurants are. As expected, it’s filled with the usual Filipino favorites—stews like sinigang and kare-kare, sisig, grilled meat and seafood, et cetera. It’s also pretty much a bar so they serve a lot of cocktails as well. 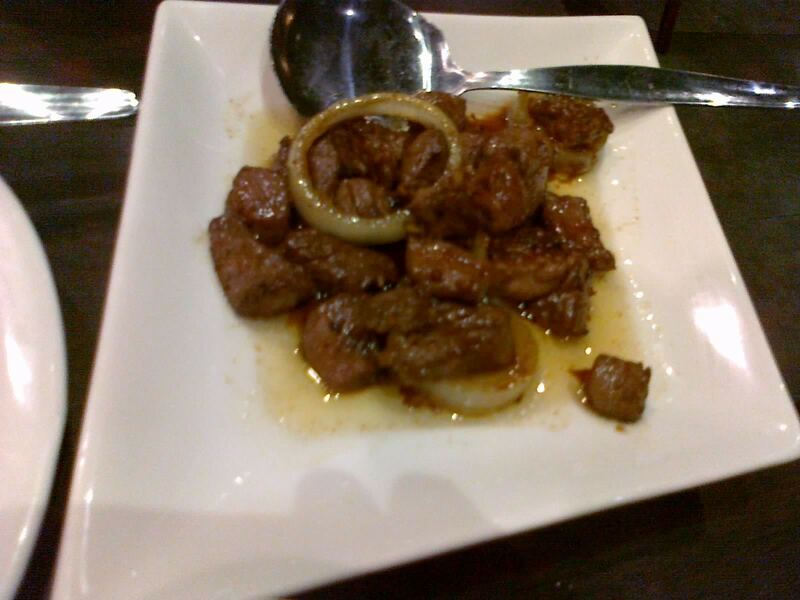 Anyway, as I’ve mentioned above, beloved saw that they serve ostrich, so she got herself their Salpicao Ostrich (320 Php). I was torn between crispy pata and inihaw na liempo, but saw that their pata had a twist, so I ordered their Crispy Boneless Pata (440 Php). Even though they also serve different kinds of rice good for many, we just ordered ourselves a couple of cups of plain ones priced at 30 Php each. We also ordered their bottomless iced tea at 65 Php each for our drinks. The drinks came first, but that’s negligible as it’s your usual instant one, nothing interesting there. We had to wait for quite some time before our order came, and they came in all at once. I’ll start with their Crispy Boneless Pata. While it’s not entirely boneless, the huge leg bone was devoid from the loins and it’s pretty much just meat and skin. And for it’s price, I thought it was worth it. It’s basically good for 3-4 people. It’s served topped with bagoong and sided with sauce. No veggies, which I would probably have liked considering how tiresome pork can be after a while. Nevertheless, it’s pretty good. The skin was crunchy as it should be, and delicious as well. Since they’re chopped in generous portions, there’s probably no fighting for the delicious skin on this plate. The meat, well, it could be better. It’s good, yes, pretty meaty and hefty, and the taste is pretty much given to it by the sauce. My problem with it is that it lacks a bit of fat that it’s a bit on the not-so-tender side. Next, the Ostrich Salpicao. I think the only time I’ve had ostrich in my early teens and have pretty much forgotten the taste of it. I think I also just had the egg and not the bird itself. However, I can compare the tenderness of the meat to your usual beef cooked the same way. I can’t say much about the taste of the meat, as the most prominent flavor I get for each bite is a bit of the alcohol they used in this one. Quantity-wise, it was pretty disappointing, good for only two. But I guess that’s how you price a not-so-common meat in a restaurant like this one. All in all, their food was good. There was pretty much no problem with the taste and how our food was done. Our experience could’ve been better, though. Maybe if we didn’t order two high-priced viands, we would’ve gotten more variety and maybe we should’ve chosen food that actually complemented each other. Perhaps if we didn’t order the ostrich and instead gotten veggies or soup and an appetizer, this could’ve been a better experience. Value-wise, yes, I guess it’s up there. The food we ordered was basically good for four people, and we paid almost a thousand for it. Excellent if you consider the quality. All in all, this is one of the few Filipino restaurants that I’ve had a good experience in. I wouldn’t recommend this for dates, but I’ll recommend this for parties of four or more. Location: Greenbelt 5, alfresco area. Budget: 300-500 Php per head. Smart nomnomnom tip: Come in huge parties and order with variety in mind.